The Wiesel Armoured Weapons Carrier is a small, light vehicle, produced in several different variants. It was developed by Porsche during the 1970s to fulfill a West German Bundeswehr requirement for an air-transportable vehicle that could fight enemy tanks and infantry. The Bundeswehr cancelled funding in 1978, but Porsche continued development privately. The vehicle was accepted into Bundeswehr service in the 1980s. Trials of dropping the vehicle by parachute were unsuccessful, and so it is deployed by transport aircraft or helicopter. The Wiesel’s armour is proof against small arms and shell splinters, although its small size and fast speed (43mph) provide some protection. There are several variants of the Wiesel, the most common being the fire support vehicle (armed with a 20mm cannon), and the TOW ATGM carrier. 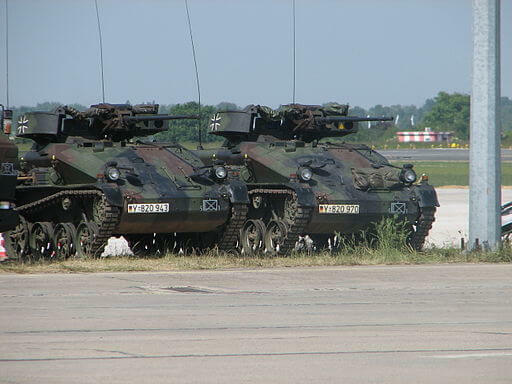 Wiesel 2 entered service with the German army in 2001. This is longer and larger than Wiesel 1, and has better protection, including NBC protection. Like Wiesel 1, it has several variants, including an APC (carrying four men in addition to the crew), HOT ATGM carrier, and mortar carrier (mounting a 120mm mortar). A more powerful engine means that, despite its greater size and weight, maximum speed remains the same. Photo: Wiesel 1A1 MK20 by yetdark, via Flickr (CC-BY-SA).